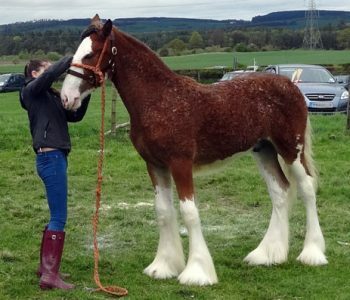 Horse Clipping; not every horse needs clipping in winter, but under certain circumstances you may want to consider removing part, or all, of his coat. The usual time to begin is from September to October. The hair will grow back, so you’ll need to repeat the process at three to four week intervals during the cold months. The final clip is in January. 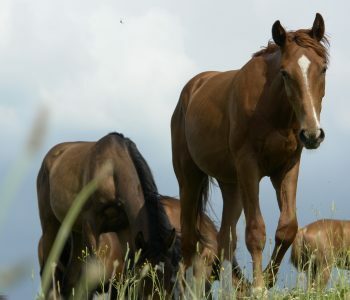 As daylight hours decrease with the onset of fall, your horse will start to grow a thicker coat. 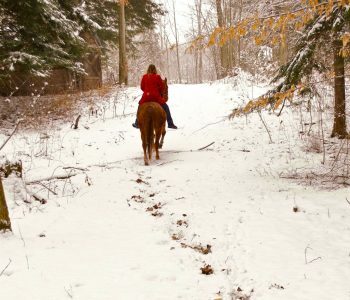 If you plan to ride regularly during the cold months, clipping your animal reduces the amount he sweats and allows him to dry off faster after work. It also takes a lot less time to groom a clipped horse! What Type of Clip Is Best? The amount of coat to remove depends on your horse’s anticipated work load and his living conditions. 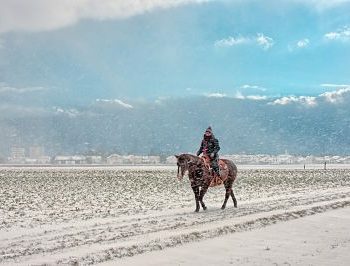 Note: After being clipped your horse will need blankets to keep warm, as he’ll have lost his natural protection against the elements. A full clip is suitable for horses being exercised hard throughout the winter, and stabled with no pasture turnout. It entails removing all the horse’s hair: not only from his body, but also his head, ears and legs. A hunter clip leaves hair on the saddle area to keep it protected, and on the legs for warmth. In some cases the lower half of the head is left untouched. This clip suits horses in medium to hard work. The blanket clip is another good choice for horses in regular winter work. The hair from the head, neck, under belly and part of the rump is removed, leaving the legs warm and protected. The large area of coat left on the body resembles the shape of a blanket. A trace clip suits a horse in light to medium work if he is turned out during daylight hours. The hair is removed from the lower half of the neck, chest, stomach and upper part of the hind legs where the horse sweats most. The low trace clip leaves more hair on than the high trace clip, where the lower half of the head hair is removed, and more is taken off the neck, barrel and hind end. The Irish clip removes only the hair round the head, neck and chest area which makes it perfect for horses in light work and turned out in the daytime. Its cousin, the bib clip, takes the coat off just the front of the neck and chest areas. This is useful if your horse is turned out year round. 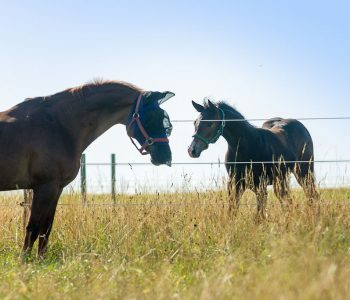 The horse clipping website created by Lister Shearing Equipment suggests giving a bib clip to a horse that hasn’t previously been clipped as a good introduction to the process. The clipping styles you choose will depend on how hard your horse will work and what his turn-out situation is. 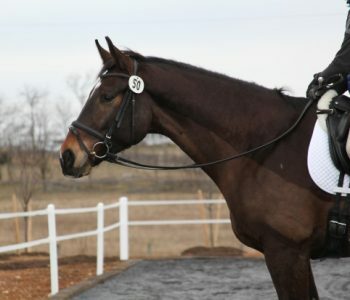 If your riding will be intermittent during the cold months, he is best left with a full winter coat. Plan extra time after exercise to dry him off before he is turned out again – with a blanket, if appropriate. 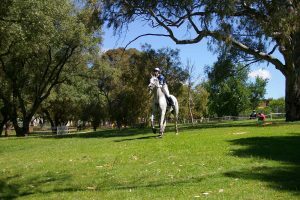 Endurance riding doesn’t require an expensive horse with fabulous gaits or jumping ability: people with ‘ordinary’ equines can participate. But success in this sport does rely heavily on fitness training. This demands a lot of time working with your horse and forms part of the appeal for many riders. Endurance trails cover varied and sometimes challenging terrain. Depending on the level of difficulty, they can include rugged land, and long climbs with correspondingly steep downhill slopes. There are three categories of endurance competition, including one for those starting out. At least 50 miles are ridden in one day, with a maximum allowed distance of 150 miles to be completed in three days. These are between 25 and 35 miles long. Allowed times are 6 hours for 25 miles and 8 ½ hours for 35 miles. Less than 22.4 miles, and held in conjunction with official endurance rides hosted by the American Endurance Ride Conference (AERC ). These rides don’t count towards points or miles with the AERC. The maximum allowed time for completing any of the above distances includes en route and post-ride vet exams. Within 30 minutes of stopping, the horse’s heart beats per minutes must be down to around 60 bpm. Rule No. 3 of the AERC Rules & Regulations states that “any breed or type of equine” must be allowed to participate. The AERC Endurance Riders Handbook, American Endurance Riders Conference (Chapter Three) gives a helpful overview of suitable endurance horse types. Certain breeds naturally have speed and stamina, especially the Arab and many Arab crosses, including the Araloosa (Arab/Appaloosa cross). Pure-bred Appaloosas rate highly, too, as do Standardbreds. Regardless of breed, good confirmation is essential: the grueling conditions will exacerbate any weaknesses in the horse’s build. Strong hooves are another must, to withstand the demanding terrain. “Equines entered in the full distances must be at least 60 months old at the time of the ride” (Rule 3.1) and in Limited Distance Rides they must be at least four years old (Rule L2.1). The animal’s actual date of birth is used to determine eligibility. If the horse has no papers, the control judge uses discretion in assessing age. 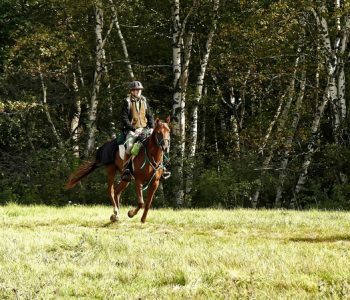 Who Can Take Part in Endurance Riding? There are two riding divisions: Senior and Junior. Seniors have four weight divisions (Rule 8.5.2): Heavyweight, Middleweight, Lightweight and Featherweight. This fun and fast-growing sport develops stamina and staying power in both horse and human. The months and years of training together create a close bond between them, and every partnership to successfully cross the finish line of an endurance race is a winner. Event horses are all-round athletes. They must be skilled in the three separate disciplines of dressage, stadium jumping and jumping cross-country, and have the stamina to perform in all three phases within a short space of time. In addition, they require endurance for galloping up and down hills while negotiating rustic obstacles. Appropriate fitness training is therefore essential for the eventer to perform comfortably and be a real contender in competition. World Champion Blyth Tait, event rider and Olympic gold medalist, writes in Eventing Insights that it’s a good idea, when drawing up your horse’s training schedule, to work backwards from the day he needs to be fully fit. For the animal which has been off for a while, he suggests allowing seventeen to eighteen weeks for bringing him back. He aims to achieve peak fitness in his mount one week before a big event. This time frame gives enough leeway for any unforeseen setbacks or, if the horse gets fit early, to maintain that level of readiness. He believes in steady roadwork and riding on the trails in walk to start with. In the online edition of Horse & Hound, Josephine Carr writes that the professionals usually build up from half an hour on the first day to one hour on day seven, working towards two hours at the end of the second week. Then he adds trotting on tarmac (where safe) as this “can help to assist in the hardening of the hooves and strengthening of the bones.” He is careful to maintain a slow pace to reduce jarring on the legs. He also introduces some “simple flatwork sessions a few days a week.” This gets the horse listening to his rider, develops muscle tone and makes him suppler before the work becomes more arduous. Now is when he begins giving the horse hard feed, if he was previously out at pasture. It is now time to introduce more canter work, including interval-training. In his book, Cross-Country Masterclass, Olympic Champion Leslie Law says that he starts this fast work gently in a ‘strong working canter’ over four to five furlongs uphill twice a week. “It does help to work some horses together, as they seem to draw inspiration and encouragement from company.” However, he doesn’t advocate this with strong, excitable horses! Interval training begins with alternating short periods of stress with recovery times. He gradually increases the periods of fast work but allows the same recovery time. 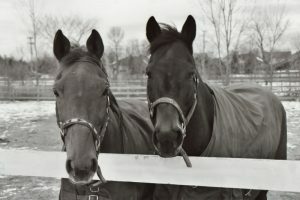 Tait plans these canter sessions every fourth day, with the intention of minimizing potential injury or giving minor stress issues time to repair before the next time. He begins by alternating three five-minute sessions of steady canter with three minutes’ walk recovery time. The length of canter time is gradually increased, but the recovery phase remains at three minutes in walk. A large flat field is used for this work. His three-star event horses maximize their canter spurts at nine minutes. That time will be less for those riding in the lower levels. Horse & Hound suggests a once a week session of two five minute canters with three minutes’ walk recovery for novice one day eventers. These horses need fewer weeks to reach the necessary level of fitness than upper level equine athletes, and will usually be ready within three months. Between the interval training days, the horse’s flatwork continues, becoming more intensive, and jumping over fences begins. British show jumper William Funnell “starts with some cross-poles built into the flatwork” and includes bounces to “build and maintain the jumping muscles.” He doesn’t believe that high jumps are necessary to get the horse fit. 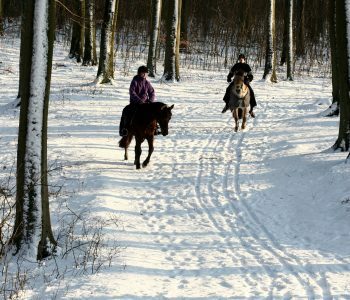 Training also includes trail riding (or ‘hacking,’ as it is called in the U.K.) which both conditions the horse and relaxes him. 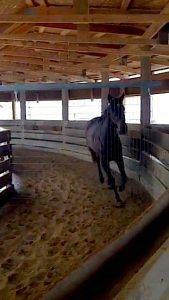 Exercising on off days on a horse exerciser also helps conditioning at a low stress pace. When Is Your Horse Fit? 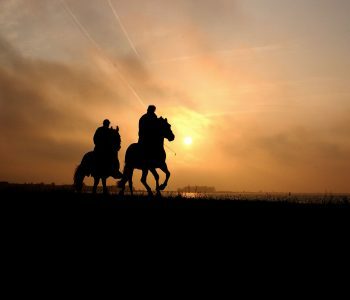 As the horse becomes fitter and his heart becomes stronger, his heart rate decreases. Your horse’s heart rate should be below 100 bpm after that time. If not, he is being pushed too hard and the horse should not canter again until it reaches approximately 80 bpm. If his bpm are less than 60 after the three minutes’ walk you need to toughen up your program! Event horses have arguably the most arduous yet varied lifestyle of all the English riding disciplines. They must train to a high level of fitness to meet the demands of the three phases of a one or three day event. This involves developing strength and suppleness for dressage, and combining it with stamina for the stadium and cross-country phases. A horse coming in from a long period of down time at pasture will require between three to four and a half months of training to bring him back to peak fitness.